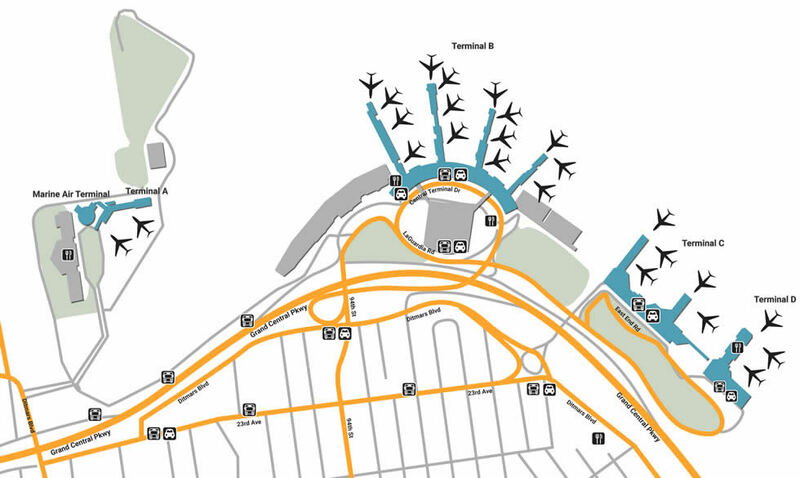 Find the areas you need at the New York LaGuardia Airport and save time using our maps before wandering the airport. Located in the heart of New York’s rustic Queens Borough, LaGuardia Airport is a great airport to find yourself, whether it’s between flights or on arrival to an important business convention. Make sure you have everything you need before embarking on a brave new world, enjoying the small pleasures in unique shops while taking in the memory of going somewhere special where someone special is waiting for you. If you’re visiting The Big Apple and have experience getting around Manhattan, then you know that driving is way more antiquated than walking. Utilize the magic of New York’s public transportation system by leaving your car at the airport. You can book online, giving yourself the closest options for either of the four lots, whether it be the covered daily parking for the B/C/D Lot, which offers the first 3 hours free of charge, or the Hourly Parking closer to Terminal D. Parking Lot A is the closest to Terminal A, which is right next to the long-term economy parking. In dire circumstances, the little things always shine through. Enjoy your time at LaGuardia Airport by being thankful for the useful services, from the casual pet relief area located at Terminal A’s Marine Air Entrance to Terminal B’s exclusive Centurion Lounge, a relaxing scenery only valid to global Platinum Card/Centurion Members. If you need to exchange your currency, head to Travelex, located at Terminal B’s Departure Level, and be sure to prepare for the fast Subway life by getting a Metro Card at the Welcome Center in Terminal D.
All of the retail shops at LaGuardia are well-organized, well-lit, and located at Terminal B. Grab a special gift at Discover New York, a diverse shop located between Concourses B & C. If you’re planning to explore the six million acres at Adirondack Park, head to Eddie Bauer for outdoor wear, accessories, and mountain gear. Look good before important meetings by getting a sharp polo shirt at Lacoste (Terminal B), or enjoy a one-of-a-kind candy at the locally famous Lick store. Grab some casual French food at Au Bon Pain, located inside the bright food court at Terminal B. If you’re more interested in an experience, enjoy the classic ambiance of Angelina’s Metro Market, a grab-and-go that offers real choice. Those who are arriving at night and haven’t eaten all day should grab a hefty burger at Five Guys, located at Concourse D’s food court, or enjoy your morning arrival with a cup of coffee from World Beat, right outside of Terminal D.